The Beatles may have sung about sitting in an English garden waiting for the sun, but the real magic is inside the English cottage where vintage charm takes center stage. On either side of the pond, the gently distressed antique look has skyrocketed in popularity. It manages to convey both sophistication and comfort simultaneously, with a serious splash of refinement and vintage appeal. If you’re one of the growing number of devotees to this trend, Green Front has you covered with a carefully selected range of pieces from Shabby Chic and Washable Wonders as well as antiques directly imported from England. Whether you want to add a little aged beauty to your space or a lot, be sure to check out these offerings located in Building 8 of Green Front’s Farmville location. This petite table was one of a handful of antique items handpicked by Green Front and imported directly from England. Capture the charm of the British countryside with the scalloped teal accent bowl from Wildwood, perfect for displaying a burst of brilliant blooms. An Abigail accent chair and a Portobello slipcovered Shabby Chic chair, both from The MT Company, complete the perfect cozy cottage look. Finished in teal and cream, this cabinet combines function and elegance with lovely distressed detailing. From England, this truly one of a kind piece will add just the right amount of rich flavor to your space, while still giving a laid back vibe. This Shabby Chic chair’s antique white finish and beautifully detailed carving are perfectly complemented by the pale rose colored upholstery. You don’t need a parlor, or a cottage, to appreciate the elegant appeal of this lovely piece. This beige sectional features clean lines and simple styling, making it an ideal staple for all your vintage inspired accents, colors and finds. 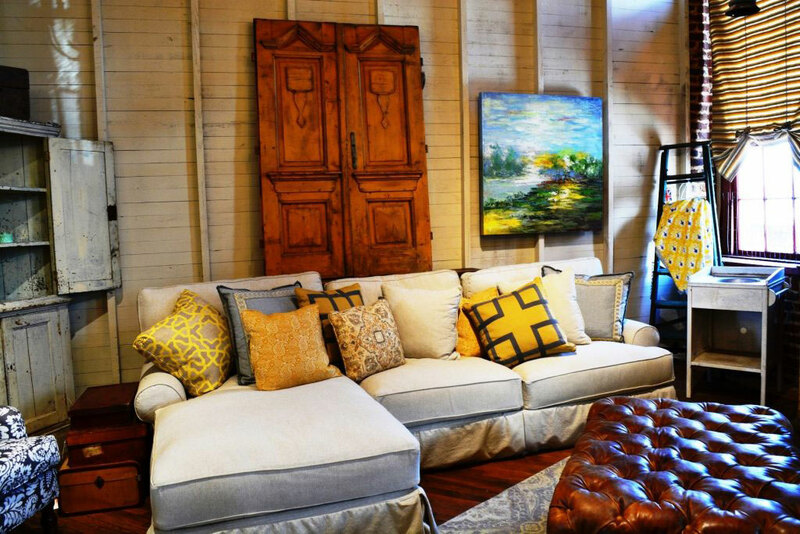 The throw pillows from Bernhardt, King Hickory, and Klaussner add a pop of warm color. Cream colored and perfectly aged, this antique English import harkens back to a time when indoor living space was a prime commodity. Whether you need to save a little space yourself, or are just in love with its vintage romance, this distinctive cabinet is a subtle nod to older days and simpler times. Note: The jadeite kitchenware featured here is from a private collection and not for sale. This entry was posted in Latest Trends, News From Green Front.